Kristian Saucier, 29, of Arlington, Vermont, pleaded guilty today before U.S. District Judge Stefan R. Underhill of the District of Connecticut to one count of unauthorized possession and retention of national defense information. The guilty plea was announced by Assistant Attorney General for National Security John P. Carlin and U.S. Attorney Deirdre M. Daly of the District of Connecticut. 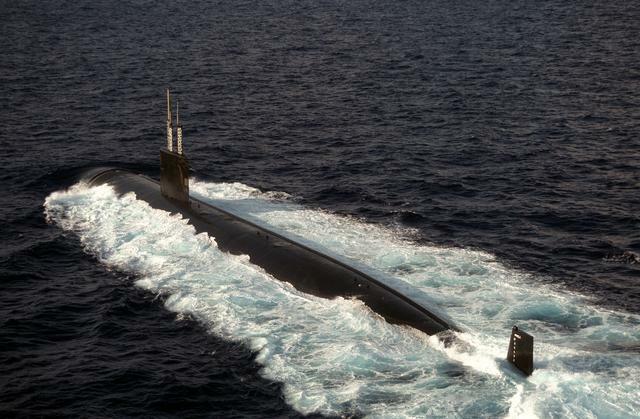 According to court documents and statements made in court, from September 2007 to March 2012, Saucier served as a machinist’s mate aboard the USS Alexandria (seen in the above U.S. Navy-released photo), which is a U.S. Navy Los Angeles-class nuclear attack submarine based at the Naval Submarine Base New London in Groton, Connecticut. On at least three separate dates in 2009, Saucier used the camera on his personal cellphone to take photographs of classified spaces, instruments and equipment of the USS Alexandria, documenting the major technical components of the submarine’s propulsion system. On Jan. 19, 2009, Saucier took two photos, one of the auxiliary steam plant panel and the other of the reactor compartment viewed through a portal. On March 22, 2009, Saucier took two photos that, when placed side by side, provided a panoramic array of the maneuvering compartment, the room from which the propulsion system of the boat is operated. On July 15, 2009, Saucier took two photos documenting the reactor head configuration of the nuclear reactor and a view of the reactor compartment from within that compartment. Saucier had a secret clearance and knew that the photos depicted classified material and that he was not authorized to take them. He retained these photos and failed to deliver them to any officer or employee of the United States entitled to receive it. The investigation began in March 2012 when Saucier’s cellphone was found at a waste transfer station in Hampton, Connecticut. Saucier was interviewed by the FBI and Naval Criminal Investigative Service (NCIS) in July 2012 and was confronted with the classified images from his phone. Following that interview and in an effort to impede the federal investigation, Saucier returned to his home and immediately destroyed a laptop computer, a personal camera and the camera’s memory card. Pieces of a laptop computer were subsequently found in the woods on a property in Connecticut owned by a member of Saucier’s family. Saucier was arrested on a criminal complaint on May 28, 2015, and was subsequently indicted. Judge Underhill scheduled sentencing for Aug. 19, 2016, at which time Saucier faces a maximum sentence of 10 years in prison and a fine of up to $250,000. He is released on a $100,000 bond. Saucier is currently enlisted in the U.S. Navy as a Petty Officer First Class assigned to the Naval Support Activity Base, Saratoga Springs, New York. He is awaiting an administrative separation board proceeding. This matter has been investigated by the FBI and NCIS. The case is being prosecuted by Assistant U.S. Attorneys Vanessa Richards and Jacabed Rodriguez-Coss of the District of Connecticut and Trial Attorney Will Mackie of the National Security Division’s Counterintelligence and Export Control Section, with the assistance of the U.S. Attorney’s Office of the Northern District of New York.